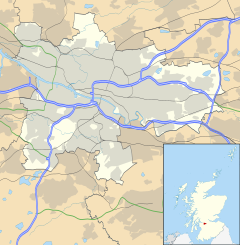 Kelvindale (Scottish Gaelic: Dail Chealbhainn) is a district in the West End of the city of Glasgow, Scotland. Kelvindale shares the postcode G12 with the neighbouring districts of: Kelvinside, Hillhead, Hyndland, Dowanhill and the University of Glasgow. The area is characterised by traditional interwar housing, formed of tenements and semi-detached houses. Construction started in the late 1920s with work being undertaken by the City Corporation. This was followed up in the early 1930s by the Glasgow-based housebuilding company Mactaggart & Mickel. The houses were intended for rent rather than for sale, they consisted of semi detached villas. A proportion of these houses were set aside for rent by Glasgow Corporation. The Corporation extended the building down Kelvindale Road towards Collins Paper Mill. Subsequently in the 1930s the Western Heritable Investment Company extended the district considerably by building the last range of pre war tenements at Dorchester Avenue, Ripon Drive, etc. between 1934 and 1938. These tenements are unique since they are built on concrete rafts due to the heavy mine workings in the district from the Garscube Estate. They were planned as four storey but due to Scots Law they were reduced to three stories. The district is dominated by the gas holders (erected in 1891 but now de-commissioned) which were reputed to be the biggest in the United Kingdom. During the Second World War the Royal Air Force stationed a balloon unit on what is now ex-MoD housing on Dorchester Avenue. The large fields were once used for grazing horses and cattle but are now the site of more tenement building and the Kelvindale Primary School. Gibson Hall, a former Glasgow Caledonian University Hall of Residence which stood on Dorchester Avenue, was recently demolished to make way for new build. Flanders House, built for soldiers of the Great War, was demolished in 2006 and has been replaced by a modern construction. Many of the street names in the area are named after places in England. These include Colchester Drive, Beaconsfield Road, Chelmsford Drive, Hertford Avenue, Manchester Drive, Kendal Drive, Leicester Avenue, Penrith Drive, Northampton Drive, Southampton Drive, Weymouth Drive and Winchester Drive. A few are named after Scottish placenames, including Grandtully Drive and Fortingall Avenue. In 2007, Bryant Homes controversially removed a large number of trees from a local lane to provide better access to a new housing development. The actor Robert Carlyle was among those who protested against the felling. In July 2009 a suspected arson attack caused considerable damage to the site. One partially constructed four story housing block burnt to the ground and the only occupied building on the site was evacuated, was among those arrested and subsequently released without charge in connection with the incident. In the early 2000s, Kelvindale remains a desirable family area near the city's West End. Kelvindale railway station was opened on 26 September 2005. It is situated on the line from Glasgow Queen Street (High Level) to Anniesland, an extension of the Maryhill Line. Several bus routes including the frequent 6 and 6A services operate along the nearby Great Western Road. The Kelvin Cycle Way which links into the Forth and Clyde Canal cycle path runs through the area. Kelvindale Primary is a non-denominational state primary school located in Kelvindale. The increasing number of residents in the 1920s lead to the desire for a local primary school, as children had to travel to Hyndland Primary School (located on the present day site of Hyndland Secondary School) in the neighbouring district of Hyndland. After the second world war, an annexe of Hyndland Primary School was built in Kelvindale (within the present day grounds of Cleveden Secondary School. The two concrete huts were thought to have catered for the first three years of primary school education. In 1963, Kelvindale Primary School was built. The original school consisted of one building with 8 classrooms, and opened its doors on 24 August 1964 with a roll of 248 pupils. Over the years, the school roll increased requiring an annexe of two classrooms to be built in 1971. Another addition came in 1977, when a building specifically to house the infants was opened. The football pitch was sold to become flats and subsequently a new AstroTurf pitch was built opening in late 2006. Kelvindale contains St. John's Renfield Church (the local Church of Scotland parish church), Glasgow Nuffield Hospital, Cleveden Secondary School and Kelvindale Primary School. In recent years, at Cleveden Secondary School and Kelvindale Primary School, the ash football pitches have been sold and replaced by new astroturf pitches. Historic images of the Kelvindale area can be found on the Virtual Mitchell website. ^ "Housing site blaze deliberate'". BBC News. 6 July 2009. Retrieved 6 July 2009.